(1)P The aim of designing a structure against the limit state of fatigue shall be to ensure, with an acceptable level of probability, that its performance is satisfactory during its entire design life, such that the structure will not fail by fatigue during the design life nor will it be likely to require premature repair of damage caused by fatigue. (1)P Structures subjected to frequently fluctuating service loads may be susceptible to failure by fatigue and shall be checked for that limit state. (2)P The degree of compliance with the ultimate or serviceability limit state criteria given in Part 1-1 of Eurocode 9 shall not be used as a measure of the risk of fatigue failure (see 2.1.3). a) An accurate prediction of the complete service loading sequence throughout the design life shall be made. b) The elastic response of the structure under these loads shall be accurately assessed. c)Detail design, methods of manufacture and degree of quality control can have a major influence on fatigue strength, and may need to be controlled more precisely than for structures designed for other limit states (see 5 and Annex D). This can have a significant influence on design and construction cost. 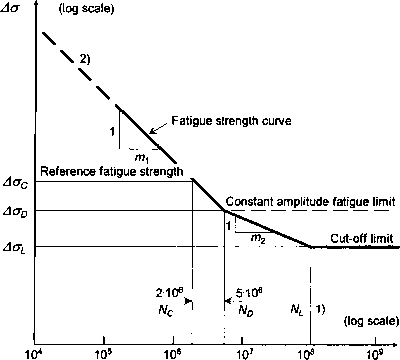 (1)P It shall be assumed that fatigue failure usually initiates at a highly stressed point (due to abrupt geometry change, tensile residual stress or sharp crack-like discontinuities). Fatigue cracks will extend incrementally under the action of cyclic stress change. They normally remain stable under constant load. Ultimate failure occurs when the remaining cross section is insufficient to carry the peak applied load. (2)P It shall be assumed that fatigue cracks propagate approximately at right angles to the direction of maximum principal stress range. The rate of propagation increases exponentially. For this reason crack growth is often slow in the early stages, and fatigue cracks tend to be inconspicuous for the major part of their life. This may give rise to problems of detection in service (see Annex B). f) roots of fastener threads. a) High ratio of dynamic to static load: Moving or lifting structures, such as land or sea transport vehicles, cranes, etc. are more likely to be prone to fatigue problems than fixed structures, unless the latter are predominantly carrying moving loads, as in the case of bridges. b) Frequent applications of load: This results in a high number of cycles in the design life. Slender structures or members with low natural frequencies are particularly prone to resonance and hence magnification of dynamic stress, even when the static design stresses are low. Structures subjected predominantly to fluid loading, such as wind, and structures supporting machinery should be carefully checked for resonant effects. c) Use of welding: Some commonly used welded details have low fatigue strength. This applies not only to joints between members, but also to any attachment to a loaded member, whether or not the resulting connection is considered to be 'structural'. d) Complexity of joint detail: Complex joints frequently result in high stress concentrations due to local variations in stiffness of the load path. Whilst these may often have little effect on the ultimate static capacity of the joint they can have a severe effect on fatigue resistance. If fatigue is dominant the member cross-sectional shape should be selected to ensure smoothness and simplicity of joint design, so that stresses can be calculated and adequate standards of fabrication and inspection can be assured. e) Environment: In some thermal and chemical environments fatigue strength may be reduced if the surface of the metal is unprotected. (1)P Safe life design: This method is based on the calculation of damage during the structure's design life using standard lower bound endurance data and an upper bound estimate of fatigue loading. This will provide a conservative estimate of fatigue life and in-service inspection shall not normally be considered essential for safety. The method is given in 2.2. (2)P Damage tolerant design: This method is based on limiting the growth of fatigue cracking by means of a mandatory inspection programme. Once a fatigue crack has reached a pre-determined size the part shall be repaired or replaced. The method is given in 2.3. NOTE: The method may be suitable to apply in certain applications where a safe life assessment shows that fatigue has a significant effect on design economy and a higher risk of fatigue cracking during the design life may be justified than is permitted using safe life design principles. Whilst the method is intended to result in a risk of ultimate structural failure comparable to that assumed for safe life design, it may result in a higher risk of temporary loss of serviceability. (3)P Design by testing: This method shall be resorted to where the necessary loading data, response data, fatigue strength data or crack growth data are not available from standards or other sources for a particular application. Test data shall only be used in lieu of standard data on condition that they are obtained and applied under controlled conditions. Guidance is given in 2.4 and Annex C.